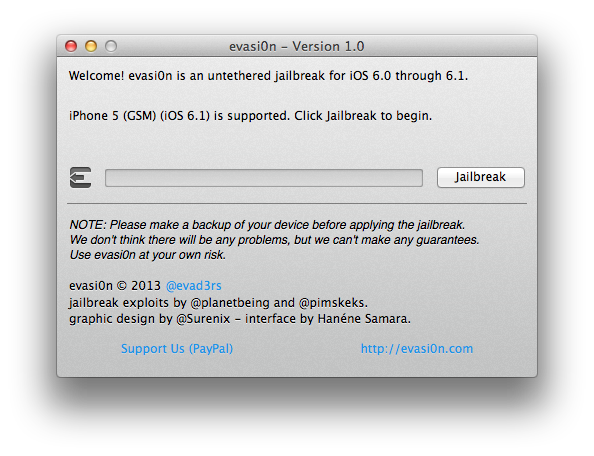 The new jailbreak named Evasi0n has finally been released and we have already jailbroken 2 iPhone 5s and an iPhone 4S. The first thing you need to know is you will need to remove your passcode lock from your iPhone. There are known problems during the jailbreak if your passcode lock is on. Once the jailbreak process is over, you can add your passcode lock back. Another thing to know is the servers are getting hit really hard right now and Cydia is loading slow. Be patient and check back every once in a while. We’ll let you know how things are as we keep testing. If you have no idea where to start you should wait for our video demo. Otherwise, head over to evasi0n.com and follow the instructions. Check back here for more info soon! All devices? The ATV3 ist not supported. And you’ve jailbroken the iPhone 5s? Wow, give us some shots. My apologies. I have not followed if this jailbreak works on the Apple TV. So far I haven’t seen anything that says this jailbreak works on any Apple TV but again, I just haven’t researched it. I’ll check into what the progress is on that. I’m about to post a video of the jailbreak process and then on to a post explaining how to use Cydia and some of my favorite hack.